Tartar sauce… Steve Hillenburg, the creator of the long-running Nickelodeon show SpongeBob SquarePants, has passed away from complications of ALS. He was 57. 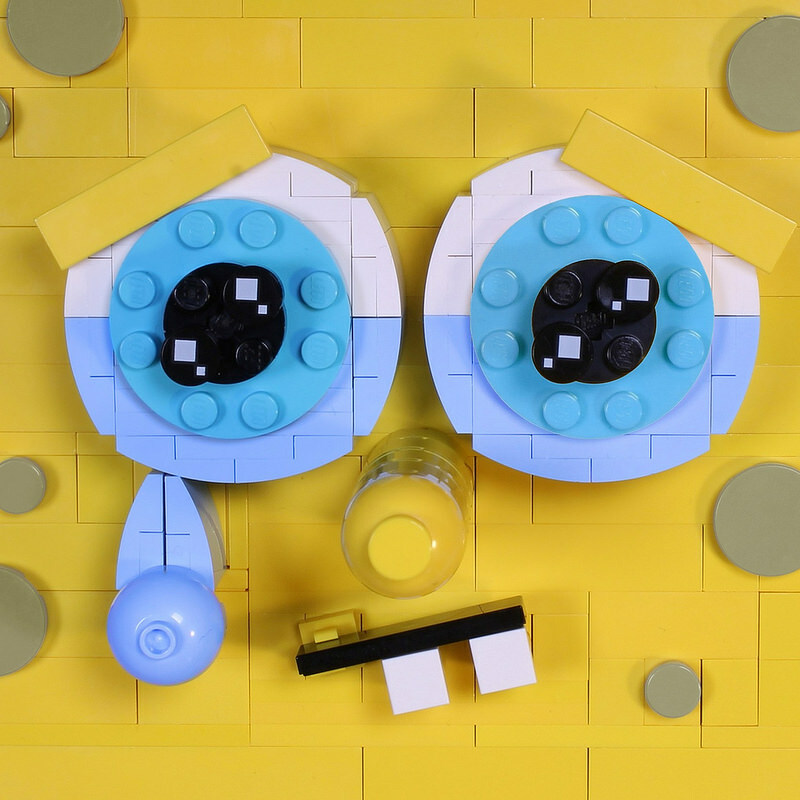 It’s amazing to think this show has been on the air since 1999, and hard to think of a cartoon character as ingrained into 21st century popular culture as Mr SquarePants, who has appeared in everything from the Macy’s Thanksgiving Day parade to LEGO sets to my favorite pair of yellow pyjamas. So long Steve, and thanks for all the fish. 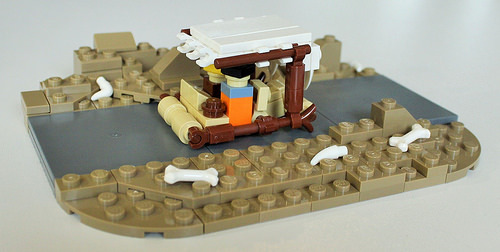 This neat microscale creation by Lennart C absolutely nails its subject, literally reducing Fred Flintstone and Barney Rubble to bricks and studs. Building at this scale requires that rare ability to see the archetypical aspects of its theme in individual elements, and who would have thought a 1×1 orange and a 1×1 brown brick would represent these Stone Age buddies so well. The foot-powered car similarly convinces in its use of cylinders for rock wheels. Here at TBB we are dazzled by so many amazing piece uses in the models we see, so it’s always good to be reminded that sometimes the base elements of the LEGO system are all that’s needed to have a yabba-dabba-doo time! Predating Monk by a few decades, this gripping TV detective show featured a pair of chipmunks ready to solve any crime, no matter how or small. 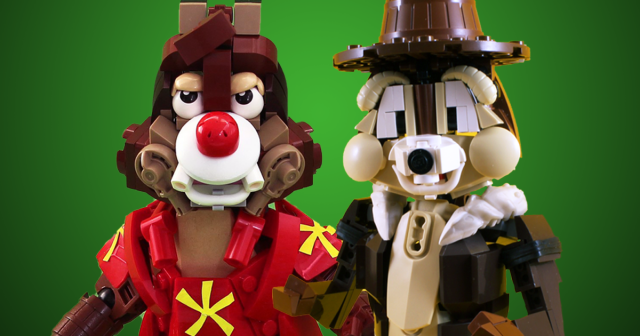 Chip & Dale: Rescue Rangers was a staple of kids’ cartoons in the 90s, and now this dynamic duo has been brought to the brick by an equally talented pair of builders, with Chip built by Leonid An and Dale by Vlad Lisin. In addition to the main trio of LEGO Powerpuff Girls revealed yesterday, the entire cast of minifigure characters from the popular cartoon series has now been revealed. 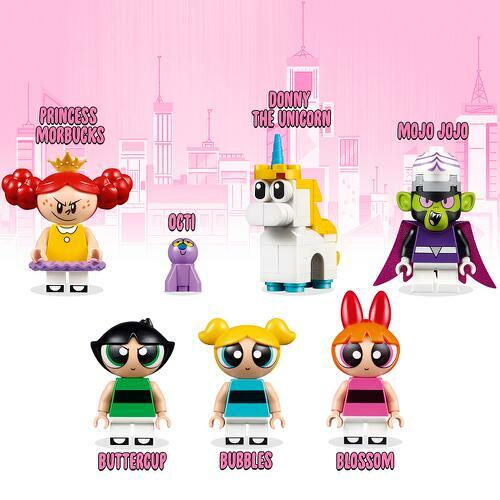 Joining the lineup up of fan-favorites includes Princess Morbucks (with perhaps the biggest molded minifgure head of all time), Octi, Donny The Unicorn, and Mojo Jojo. The LEGO Powerpuff Girls theme will consist of at least two sets available in August, including 41287 Bubbles Playground Showdown and 41288 Mojo Jojo Strikes. 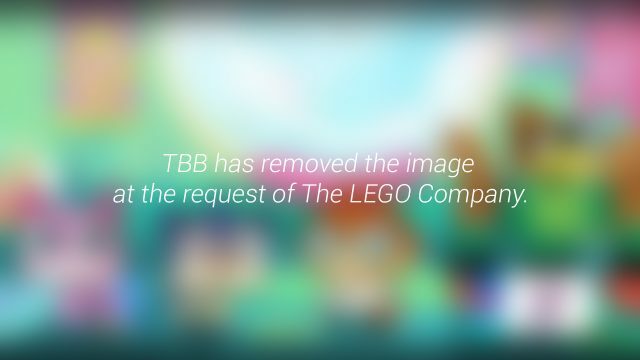 The Brothers Brick will bring you photos of the sets if available this weekend from the New York Toy Fair, so stay tuned. Today LEGO announced that a Powerpuff Girls theme will be arriving in August, consisting of at least two sets. 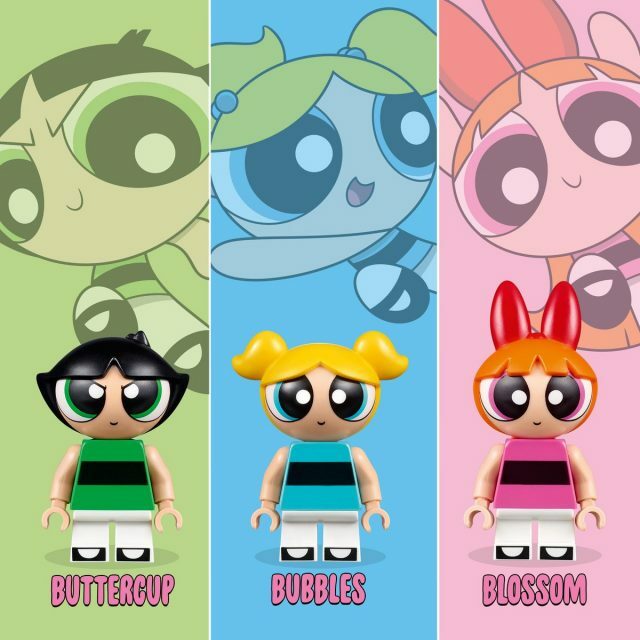 While LEGO hasn’t disclosed any set images yet, they have released images of the characters, which include Buttercup, Bubbles, and Blossom, the same three characters that featured in the Powerpuff Girls Dimensions sets last year. With his philosophical proposal “Cogito ergo sum” (“I think, therefore I am”), French philosopher, mathematician, and scientist René Descartes may have had a clever way with words. But I think Popeye summed it up admirably with “I yam what I yam and tha’s all what I yam”. Like many of us here at TBB, Oliver Becker is old enough to remember this underdog with bulging forearms, a mean uppercut, and a love of canned spinach. I love how he has managed to capture everything about this famous star of comic strip and screen; it’s almost as though he’s about to bust out with that classic line “I oughta busk you right in the mush”. As the star of his own comic strips and animated series, on both the small and big screens, Popeye became quickly ingrained in American culture, and today remains one of the most recognizable pop-culture icons in the world. The good folks of KC Bricklab have come a long way since they started the Kansas City-based LEGO club five years ago. Their most recent exploit is an incredible journey through the half live-action, half-animated feature film Who Framed Roger Rabbit. The 1988 Robert Zemeckis film is filled with hairy escapades, quick humor, and more than a bit of weirdness, and at 8 by 16 feet, KC Bricklab’s display brings it all to life. The display was a collaborative effort by 19 members of KC Bricklab, and contains the zany mainstreet of Toontown, the huge Acme factory warehouse, and a bit of psychedelic forest among other scenes. KC Bricklab began planning the build in December of 2016, and had it completed in time for display at Chicago’s Brickworld LEGO convention in June. Although the club meets monthly, most of the planning was done virtually, and the finished display for the convention was the first time the builders got to see the full layout assembled. 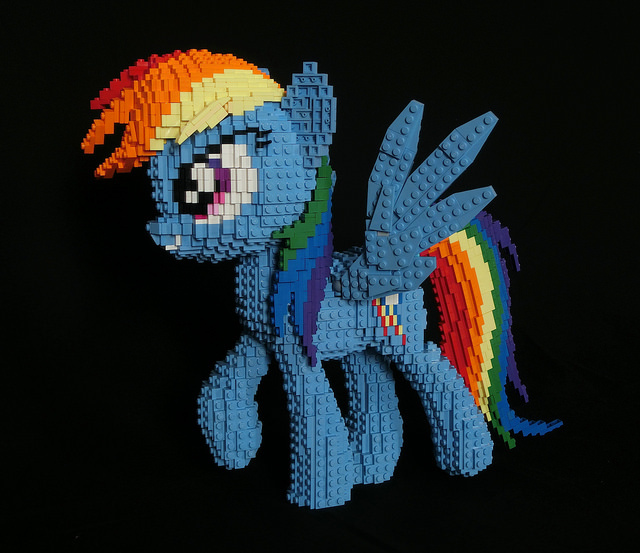 If the rain clouds are still hovering overhead then it’s time to call the cavalry, otherwise known as Rainbow Dash. In the world of hit TV show My Little Pony this pugnacious pegasus maintains the weather and clears the skies of Ponyville. 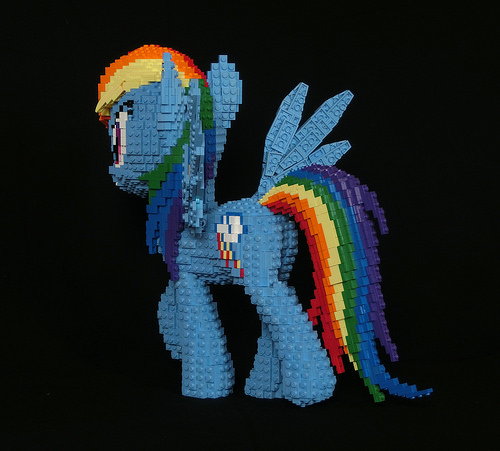 British builder Andrew Harvey used around 3700 LEGO bricks to capture Dash’s colourful likeness, even managing to give her a sense of movement in the process. This sculpture is cleverly made using a “studs out” technique for the head, body and wings – but those expressive eyes are my favourite part of this model. There’s also a view of Rainbow Dash’s swishing tail as she makes her way back to Ponyville to kick away a few rain clouds. And if you’re in the vicinity of Manchester, England this weekend you can even marvel at this model in person at the Bricktastic LEGO show. Jeepers! Zoinks! Ruh-roh ...run Scooby-Doo! Remember those good old days when Scooby-Doo and the gang used to get chased by villianous museum curators dressed as ghosts? 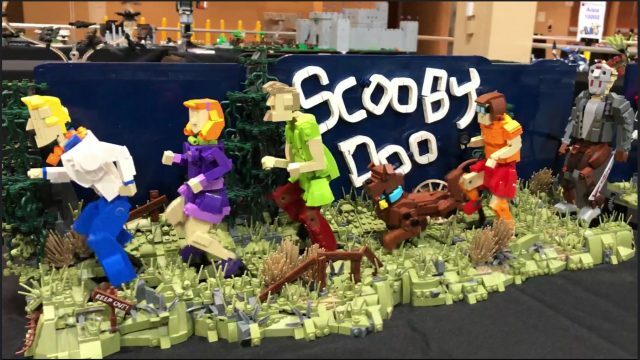 Well Tim Lydy sent the thrill of the chase up a notch at Brickworld Chicago last week with a kinetic creation depicting Scooby-Doo and the gang and running from three more recent characters from horror films. First up to chase is Jason Voorhees from the Friday the 13th movie series, then we have Pennywise from Stephen King’s novel It and finally Freddy Kruger from the Nightmare on Elm Street movies. The scary chasers are very well built and instantly recognisable. Each character has its own running style, especially Scooby-Doo himself who appears to be frantically “wind-milling”. You can view the video here. Oh, yeah! It’s time to get schwifty! 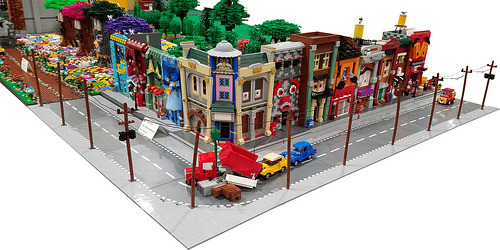 Ever since LEGO revealed their BrickHeadz line, AFOLs around the world have entered a building frenzy trying to replicate the souless, blocky style of the series. 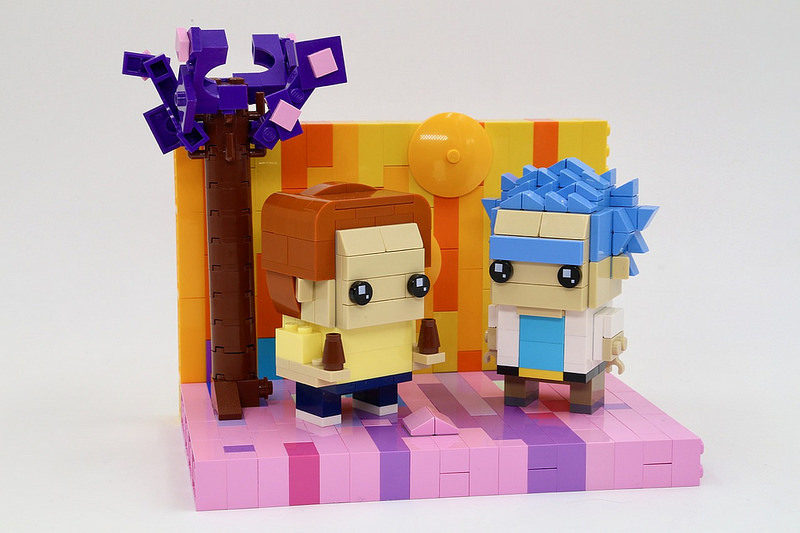 Out of the hundreds of custom BrickHeadz I’ve seen, Yang Wang‘s Rick and Morty Brickheadz are hands down my favorite. Yang chose the perfect color palette to depict Rick Sanchez and Morty Smith. Just look at Rick’s unibrow and spiky hair! Morty even has two Megaseeds. And while the background might be an offense to the eyes, it’s a clear reference to Dimension 35C (home of the coveted Megaseeds). The Brothers Brick gives you the best of LEGO news and reviews. This is our Weekly Brick Report for the first week of April 2017. TBB NEWS & REVIEWS: This week we have news about two things to look forward to and one thing to get your calculator out for. 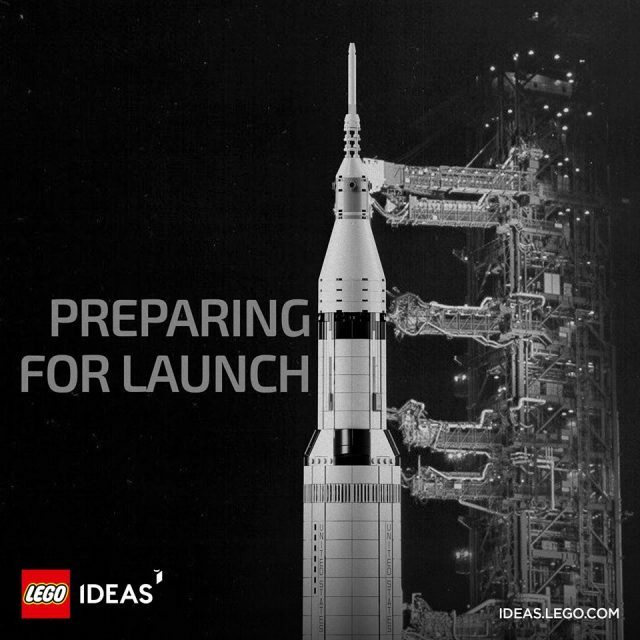 First look at the LEGO Ideas Apollo 11 Saturn V rocket coming in June – Here is the first look at the Saturn V LEGO Ideas set in all it’s black and white glory. The LEGO Movie’s Unikitty is getting her own TV show on Cartoon Network – Will Unikitty get her own TV show on Cartoon Network? Only time will tell. First set from the new Wonder Woman movie revealed – Generally spoiler free, this set reveals big bad guy Ares and the cool new Wonder Woman minifig. LEGO is a worse investment than gold – Read our investigative report on the true value of LEGO vs. gold, based on super scientific, really really serious facts and stuff. 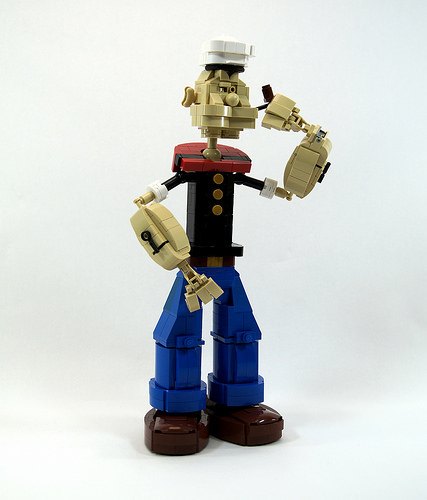 TBB INTERVIEWS & INSTRUCTIONS: You can build your own scientist or smash a MOC. It is your choice. Click a story below to choose your own adventure. 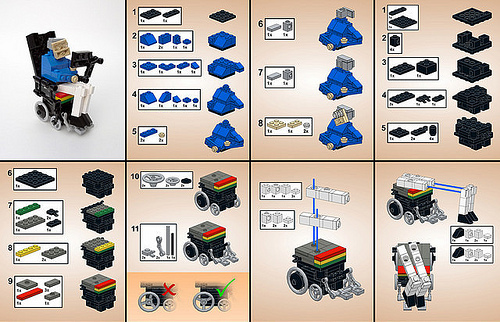 Instructions to build LEGO Stephen Hawking – TBB’s own Iain Heath shares how he made the famous Stephen Hawking LEGO model which helped launch him into the stratosphere. A conversation with Canadian Iron Builder, Tim Schwalfenberg – Could you smash one of your beloved LEGO creations? Because Tim does! Find out why. OTHER NEWS: There was a good amount of LEGO news from other places around the web this week. Here are a few items we noticed and thought you might enjoy. A working LEGO Red Keep from Game of Thrones‘ Opening, Gizmodo – Claus-Marc Hahn might be a bigger fan the opening credits to Game of Thrones than the show itself! Flybrix Review: This LEGO drone makes failure fantastically fun, Popular Mechanics – How long can your LEGO drone maintain flight? Popular Mechanics runs the tests. Sports anchor gets creative and uses Lego bricks to show NCAA highlights, USA Today – What do you do when your news station doesn’t have rights to air March Madness highlights? Recreate them in LEGO, of course!